Defenseman Jacob Bryson didn’t win the NCAA National Championship, but he still has reason to celebrate. The junior, who captained the Friars of Providence College, just signed a three-year, entry-level contract (ELC) with the Buffalo Sabres that will begin with the 2019-20 season. 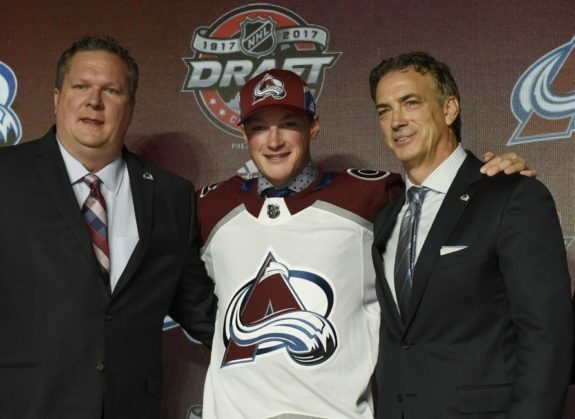 The blueliner was the Sabres fourth-round selection (99th overall) at the 2017 NHL Draft. 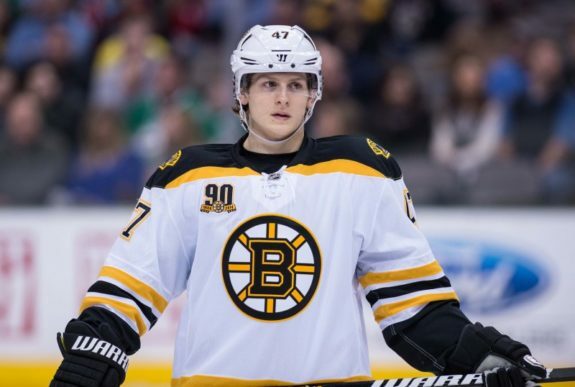 He plans to sign an amateur tryout contract and join the Rochester Americans for their AHL playoff run that starts Friday in a best-of-five series against the Toronto Marlies. A terrific puck-moving defenseman with great vision and fluid passes, Bryson creates offense and often plays on the power play. 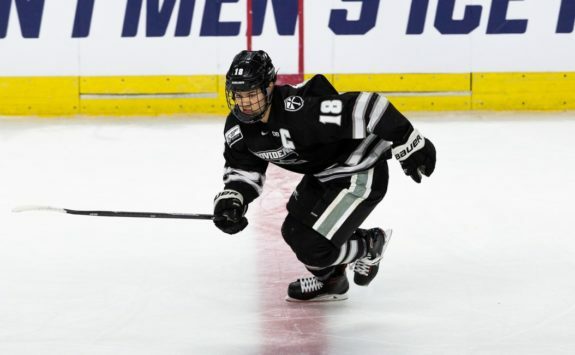 Bryson, a 21-year-old junior, served as a team captain for the Providence Friars who lost to the eventual NCAA Champions (Minnesota Diluth) in Thursday’s semifinal of the Frozen Four final recently played at KeyBank Center in Buffalo. The finance major finished his collegiate career with 11 goals and 62 assists for 73 points in 121 games. The 5-foot-9, 178-pound defenseman was a standout for the Friars. He’s gifted with tremendous offensive skills. As he fine tunes his game on the ice, he’ll also need to build up his strength. He isn’t afraid to take on bigger players. What he currently lacks in size he makes up for in dynamic speed, cutting down angles and using smart positioning. “It’s not just his speed, it’s his edgework,” said a USA Hockey national team parent who watches every Friars game. “He’s like Torey Krug, or Matt Grzelcyk.” Those two undersized college hockey products have found a home on the Bruins blue line. And their game is very similar to Bryson’s. He helped lead the Friars last year, though they fell 2-1 in a quarterfinal game against Notre Dame. It was a disappointing finish and Bryson vowed to make it farther this season. He did just that. Bryson, from London, Ontario, has a lengthy list of honors and awards. This season, he earned Hockey East Second Team All-Star honors with a 28-point season (four goals, 24 assists) in 42 games. They were career highs in both assists and points. He also notched three assists en route to a Frozen Four appearance. He was the recipient of Hockey East’s Len Ceglarski Sportsmanship Award in 2018 and 2019, earned CCM/AHCA Second Team All-American honors at the conclusion of the 2018 season. As an alternate captain in 2017-18, Bryson appeared in all 40 games, posting four goals and a team-high 21 assists. His plus-16 rating was tops on the squad and ranked fifth overall in Hockey East. The Friars went 15-1-1 when he registered a point. In 2016-17, Bryson’s freshman year, he appeared in all 39 games and ranked third among all Hockey East rookie defenseman in scoring with three goals and 17 assists for 20 points. His 17 assists were good for sixth in the NCAA among rookie defensemen. The defensemen in contention for this years Hobey Baker Award include Adam Fox (Harvard), Cale Makar (UMass), Chase Priskie (Quinnipiac), Bobby Nardella (Notre Dame) and K’Andre Miller (Wisconsin). Bryson won’t get a nod because he doesn’t have big offensive numbers, but he isn’t too far off that list. With pressure on him, the promising, late-blooming blueliner can retrieve a puck, skate it out and lead a great breakout pass from his own end. NHL Scouts love his speed and his skill. He could prove to be a steal for the Sabres who have hosted him at development camps in each of the past two summers. For now, he can chip in for the Amerks who will have their hands full with the last season’s Calder Cup champs.